Featuring a classic combination of wood and wrought iron in a decorative pattern, this bench came from a hotel in Vichy, France, a town known for its luxurious spas and healing waters. The wood is nicely aged with traces of white paint remaining, and the wrought iron frame is in good condition. A versatile late Victorian English wood and iron folding garden bench. 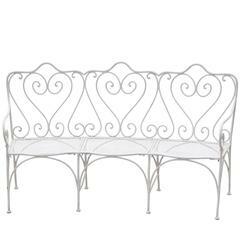 Early 19th century wrought iron garden bench. Vintage Mid-Century Modern Salterini garden or patio bench. Can be blasted, primed and painted for additional $175. In the style of Woodard. 1970s modernist wood and cast iron architectural garden, gallery benches, heavy slat oakwood construction, cast iron bases, Industrial yet elegant design. Sculptural French Art Deco wrought iron bench 1930s with removable outdoor Ikat upholstered seat pads hand finished in a rich turquoise patination. Lovely antique wrought iron bench with a beautiful pattern throughout the body.